A few people have been asking how I did the scaley nail on my Sparkly Mermaid Nails mani, so here's a tutorial for it. It's really very simple, all you need to be able to do is to make dots. First I start with a base coat, usually using one of the colours I'll be using for the dots. 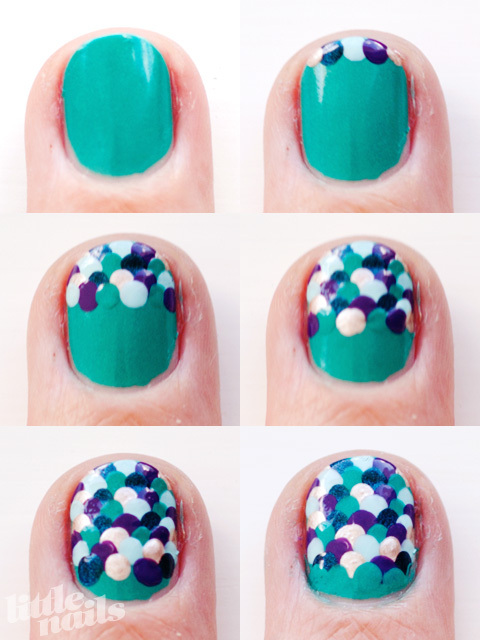 Then, starting from the tip of my nail I make a row of dots using different colours. Sometimes I put a blob of each nail polish on my desk and dip my dotter in there, other times if I don't want to waste any polish I'll just poke the brush of the polish with my dotter. After each dot I wipe the dotter on a cotton ball soaked with nail polish remover so the colours don't get all mixed up. The reason I use so many different colours is that it looks better if there aren't any dots of the same colour next to each other, and having lots of colours makes it easy to keep them all separated. After the first row, I just keep dotting different coloured dots down the nail, overlapping them like the scales of a fish. At the end I use the same colour as the base coat to sort of form a start off point for the scales. In my original mani I started from the bottom, instead of the top, so it was backwards to this, but you can do it either way. And finally, finish it all off with a nice top coat! This one is a little bit messier looking because I used smaller dots but it's the same process. So, if you can use a dotting tool and have a bit of time then you can do this mani! I hope this made sense. If you're unclear about anything just comment and I'll try to explain it in a better way. Since I popped this online I've seen a couple of other nail bloggers' designs using this tutorial and they just look so amazing that I wanted to share them here, so you can all see how awesome they look and the great colour schemes and whatnot so check out getnail-d and Delaynee's versions! Now I want to do this mani in a million different colour schemes! Thanks ladies! Great tutorial! I love this look! this idea is ADORABLE!! seriously im in love!!!! im totally gonna try this, prefect for the beach :) feel free to visit my blog! Wow...just wow! So much patience and the colours are so gorgeous! what kind of dotter should i use? What I use isn't technically a dotter, I think it's for embossing. I got it at a craft store for about 75 cents on sale! The metal ball bit is about 1.5mm in width. hello, we are a group of girls and we test your tutorial! If you wanna come see our results on our facebook page! I personally like your nails arts!! I love this! I will definitely be trying this soon! I think I may try it with all holo colors.. It will probably be waaay too much holo, but I'm going to give it a go anyway! I saw this on Pinterest. SO cute! Pretty much anything that you can dip into polish and onto your nail to make a dot could be a dotter. The special nail art ones look like these ones. 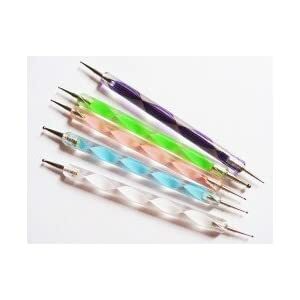 I don't have a dotter (like the nail tool) and I was wondering what I Could use that would work the same ??? Anything with a round end can be used. I've heard of people using blunt pencils, bobby pins, sewing pins, pens and all kinds of crazy things! You'd just have to play around and see what kinds of dot you end up with.